Days after our trip, a friend asked, "What experience did you enjoy the most in Paris?" For a few seconds, I struggled for an answer because the whole trip was amazing. It's hard to pinpoint one out of the hundred beautiful memories! But after much thought, I told her "It's the Parisian Picnic!" I kept my fingers crossed and hoped for a little bit of sunshine in the afternoon. It was still brrrrr cold when we were about to pick up our picnic basket, so I was like "Oookay, let's do this! Sunny or not. Rain or shine." Uhhhmm, well, I was fervently hoping it wouldn't rain. You may ask, why all the fuss? This is #1 in my Romantic Things to do in Paris list! Why is Parisian Picnic a MUST-DO in Paris? Our picnic was during the eve of our wedding anniversary, and we both felt it was the right thing to do. Paris, being the City of Love, offers a lovely backdrop for a low-key romantic feast. During the picnic, we didn't have to worry about anything else - no wait staff to interrupt our conversation, no fancy schmancy food to alienate our taste buds. It's just me and him and French comfort food! 3. It's what the locals do! Parisians love to eat outdoors, and I don't wonder! Their charming city is dotted with beautiful public parks and gardens. We saw a lot of them leisurely dining alfresco with a good picnic spread or simply a sandwich. 4. It's a way to unwind from the jam-packed sightseeing schedule. There were times when we felt like we're in an episode of Amazing Race. That's actually not a good way to see Paris. The locals that we met along the way told us that we should take our time. There's more to Paris than seeing all the famous landmarks! Where to have a Parisian Picnic? Picnics in Paris can be enjoyed in the waterfront or in the parks. I think it would be perfect either way as every nook of the city is charming. Our options were at the bank of Seine River, in Luxembourg Gardens, or in the famous Champ de Mars. Since it was our first time in Paris, Champ de Mars seemed like the best location. It is a public park located a stone's throw away from La Tour Eiffel! 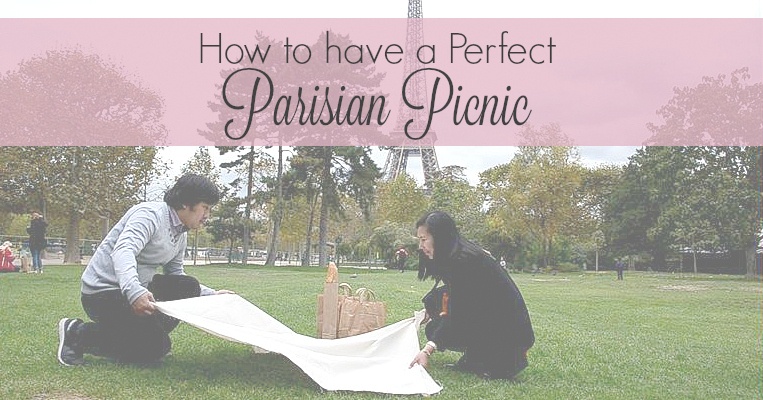 How to picnic like a Parisian? We had a hectic tour schedule in Paris that there's no time to do the food shopping. And besides, Ed and I are not picnic experts. It's our first time in Paris and we don't really know what cheese or meat or wine to buy. Good thing, we stumbled on to Secret Picnic months before our trip. We ordered a picnic basket online and they took care of everything! All we had to do was to pick up the goodies in their office and choose a picnic location. During peak season, they can also deliver at Champ de Mars. Talk about convenience! Secret Picnic has several picnic baskets to choose from. We chose The Parisian - a classic French picnic spread composed of traditional baguette, homemade salad, assortment of French cheeses, charcuterie, artisan crisps, fresh fruit salad, madelienes, water, and of course, a bottle of fine French wine! Ed and I spent two hours indulging in fresh and delicious French food! He raved about the prosciutto in every bite, while I swooned over the array of French cheese. And nothing beats a glass of red wine under Paris' chilly breeze. Ahhhh! It was a relaxed wedding anniversary celebration, and I wouldn't have it any other way! Our picnic basket was provided by Secret Food Tours' Secret Picnic.